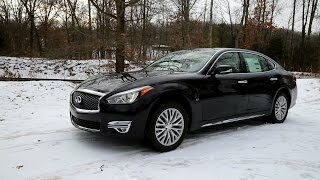 With its Recent release Infiniti Q70 at the 2014 New York Auto Show; company has also announced the longer wheelbase version Infiniti Q70L 2015. With this variant offering little extra space to buyers Infiniti is intending to capture preferably the Chinese market. Offering some extra rear legroom Infiniti Q70L has added another star to its badge, with already engine options and attractive looks glorifying the honor. 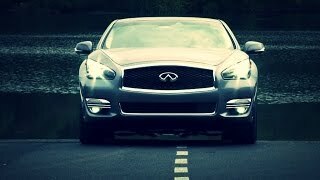 Let us check Review of Infiniti Q70L 2015 to know more about the model. Interior of Infiniti Q70L is very much similar to its sibling Q70 but making the letter ‘L’ worth, yes there is enough of space added. Especially rear leg room, which gets 5.9 inch stretch to give you utmost comfort irrespective of how long you can take your legs so as to get in resting stance. Another commendable feature is auto-door shut feature which on its own closes the rear doors, adding to the queue joins 12V power outlets and personal reading lights. Model also gets rear heated seats with premium package offered by company. This is one out of the eight packages company is offering with this spacious sedan, they are: Deluxe Touring, Sport, AWD Sport, Sport Touring, Technology, V8 LWB Deluxe Technology and Performance Tire & Wheel and Premium Package. Exterior of Infiniti Q70L is similar to its sibling part from a larger wheelbase and extended length. 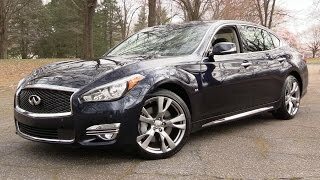 Benefit of these extensions majorly recites inside the Infiniti Q70L 2015, however outside it definitely gets an aggressive athletic stance. Talking about similarities, we mean the design and features like LED arrangements, fog lamps location, front bumper, 20” wheels and the flattened trunk lid. Nothing as such received a change in shape; model just received a little more slope from roof till the hood, a broader trunk and front fascia which positively features more aggressive looks. 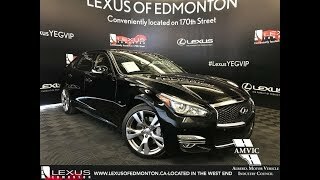 Infiniti Q70L 2015 comes with two options beneath its hood; starting with a 3.7 Liter V6 engine that offers total output of 330 hp and peak torque of 366 nm while second being a 5.6 Liter V8 delivering total output of 416 hp and peak torque of 561 nm. These engine options come with both RWD and AWD mechanism paired to seven-speed automatic transmission.